« Guantanamo: What Kind of Justice? The GOP Platform: Divider or Uniter? At their convention in Boston last month, the Democrats made a big show of their unity in the cause to oust George Bush. Tensions and divisions that usually hobble the Party were kept at bay, and the Dems maintained an almost GOP-like “message” discipline. It’s ironic, then, that going into their own convention, Republicans are showing signs of disunity over the party’s platform, with moderates and conservatives at odds over some key issues. The 110 members of the Republican platform committee spent Wednesday and Thursday reviewing and amending the first draft of the document (to be presented to the convention on Monday). And conservative factions spent much of Wednesday torpedoing compromises on divisive social issues like gay rights and abortion. 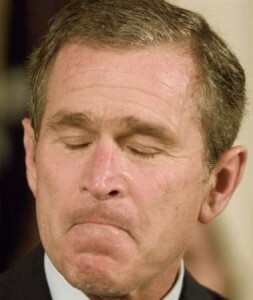 “The Bush White House completely abandoned the old platform process. While Democrats went through a seemingly democratic procedure to create a sham platform skirting contentious issues, Republicans have a real platform that was handed down like the Ten Commandments. The subcommittee chairmen got their first glimpse of it last weekend, but it was kept from the other 100-odd committee members until after their opening reception Tuesday night. The Republicans already had to mend fences over the list of convention speakers, adding a number of right-wingers to the roster after conservatives complained about the prominent roles of moderates like Schwarzenegger, McCain and Michael Bloomberg. And they did it again on the platform front Wednesday, adding language in support of a constitutional amendment against gay marriage (the 2000 platform merely stressed support for the “traditional definition of marriage”). But with conservatives and moderates threatening to stay home if they don’t get their way, Republicans will have an uphill struggle to energize the entire base.